Kanaparthi is a seashore village located at a distance of 10 kms. from Naguluppalapadu, the Mandal Head Quarter and 30 kms from Ongole, the District Head Quarter. It is a historic village stands on the left bank of river Gundlakamma. Historically, it is known as Kanakapura, Kanakapuripattana and the entire village is studded with Archaeological remains. The Buddhist Stupas were discovered and excavated by the British Scholars and the remains in the form of stupas were protected by the Archaeological Survey of India. The State Archaeology and Museums Department has collected 120 stone sculptures datable from 2nd to 16th Century A.D. from this village. A big hall was constructed in 1982, the sculptures were erected on the pedestals in hall as well as in the open space and opened the museum to the public in 1983. The Museum was named after Andhra Kesari Sri Tanguturi Prakasam Panthulu, Former Chief Minister to Madras Presidency, Great Freedom Fighter and whose maternal Grand Father’s Residency is in Veerapunayanipalle, which is 4 kms. to North of Kanaparthi. 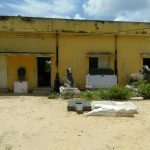 Recently, some broken lime stones panels and slabs were shifted from Neelayapalem village of Chinna Ganjam Mandal to this museum and they became an attraction to the visitors. The important sculptures are exquisitely carved Nandis, Saptamatrukas, Surya, and Bhairava etc.